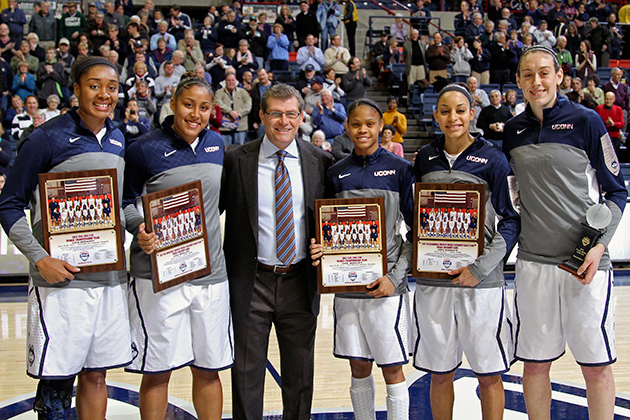 Five Huskies were recognized for their USA Basketball accomplishments on Tuesday before the women’s basketball game against Houston at Gampel Pavilion. Moriah Jefferson ’16 (CLAS), Morgan Tuck ’16 (CLAS), and Breanna Stewart ’16 (CLAS) led Team USA to the U19 World Championship gold medal in Lithuania last summer. Bria Hartley ’14 (CLAS) and Kaleena Mosqueda-Lewis ’15 (CLAS) led Team USA to the 2013 World University Games gold medal in Russia last summer. 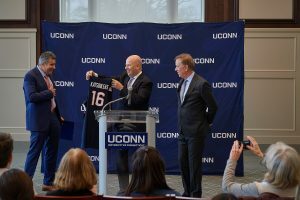 Stewart also was honored Tuesday afternoon as the 2013 USA Basketball Female Athlete of the Year for the second time, having won it in 2011 while still in high school, and is the youngest repeat recipient of the award. She is one of only five athletes to be honored more than once, including former Husky Diana Taurasi ’05 (CLAS), who won it in 2012, 2010, and 2006. Former Husky Tina Charles ’09 (CLAS), won the honor in 2009.